Why the NauticEd Sailing Resume? How does the Sailing Resume work? How do I progress through the ranks? How do I progress through Badges? What is the Verified Competency Mark? What is the Logbook Resume? What is the cost for the Sailing Resume and Logbook Tracking system? First watch our short video and see the discussion on this page about why a sailing resume trumps a sailing certification every time. 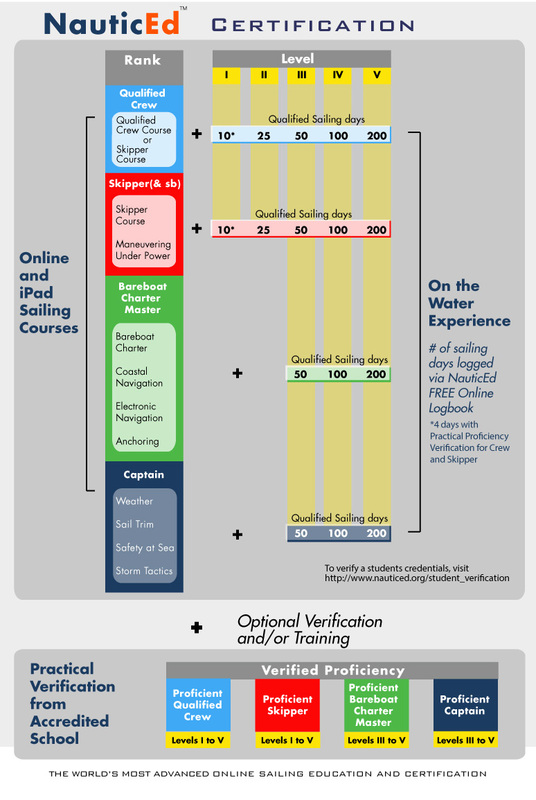 Now, watch our 3 minute video on how to gain a sailing resume and certification with NauticEd. With changing times, it's time for sailing to keep up. It's no secret, people are busier than ever. They have more demanding jobs, they want more time with their families and want more time for other recreational activities. For many, the prospect of sitting in a weekend class room is too much. They'd rather be on the water. Yet studies show that people also want personal continuing education and recognition. NauticEd is a perfect match for all this. Spend your time learning the theory of sailing at home in your own time -1/2 hour here -1/2 hour there - ten at night in your pj's. Doctor's, nurses, airline pilots do online learning and sailing is no less of a fit to learning the theory online. While on the water experience is essential, the safe operation of a sailboat and responsibility for the crews lives also rests with understanding the vast amount of theory presented on Nauticed. NauticEd provides the medium for documenting everything in one place, your theory skills, your practical experience and your time spent with a professional instructor. Often times, a sailor has enough experience to be an extremely accomplished sailor yet has had no professional practical schooling. Under any other sailing certificate system, this sailor goes unrecognized. However, charter companies will happily accept this sailor based on a qualifying logbook resume. Hence, the NauticEd Sailing Resume provides a means for the sailor to be recognized without professional practical schooling. With NauticEd, sailing schools can do what they enjoy most and what they do best - teach practical skills on the water. Students show up at a practical school with the theory out of the way and an equal base level of understanding. The student spends more time on the water and gains a real appreciation for the wind in their face, the exhilaration and the fun. Finally, in the electronic age, there is no reason for a sailing certificate to take weeks or months to be awarded. With NauticEd, once the student is qualified, they instantly gain their sailing certificate and it can be downloaded immediately. Upgrades are automatically calculated and instantly awarded by the proprietary NauticEd Sailing Resume and Certification software. Why document on the water experience? Pilots record their flight time in a logbook because it is an absolute must for determining the potential competency of the pilot. The United States Coast Guard and most other country's coast guard or maritime agencies require a person to document their practical time on the water for professional boating licenses. Yet, in reality few if any sailors document their time in a paper logbook. Practically, it's just not done. Charter companies, however, when determining if they will charter a boat to you, will ask you every time for a sailing resume and a list of practical experience to ascertain the worthiness of the sailor - and rightly so. Sailors typically scramble to determine their sailing experience and often misquote real experience due to lack of documentation. Sailors deserve to be recognized for their experience. Other than NauticEd, there is no existing sailing certificate that recognizes this because of the previous lack of practicality in logging time on paper. Times have changed and NauticEd has met the challenge to recognize sailors for their achievements. NauticEd has made it easy to document on the water experience using the power of the Internet. After a days sailing you can simply boot up your iPhone, Android device or hand-held web browser, run the application, hit one button and viola - you've logged your day out on the water. Alternatively, you can log any experience past or present via your Facebook page or just log into NauticEd.org and do the same. It's that simple and easy. How does the NauticEd Sailing Resume system work? The NauticEd Sailing Resume takes advantage of the power of the Internet. It helps students track their actual time spent on the water, which is where real hands-on learning takes place. The more time spent on the water, the more experienced and capable a sailor will be. This is why for example the United States Coast Guard requires 1 years worth of time spent on boats as well as extensive theory test out before one can attain a USCG professional captain's license. Students graduate through the Ranks by the theory sailing courses they have taken and passed. Students move through the "Levels" of Rank by the experience they have gained on the water. Students are acknowledged for verified proficiency by accredited schools. How do I progress through the Sailing Resume Ranks? All students automatically start out as "Crew - Level 0". Optionally, they can progress to Qualified Crew Member or chose instead to jump straight ahead to Skipper which is what most students do. Qualified Crew Members have completed either the Qualified Crew Member Course or the Skipper Course and have logged a minimum of 10 crew qualifying days (see below for the definition of "Qualifying days"). Alternatively, the student can shortcut the 10 days to 4 days with practical competency training and verification from an accredited Hands-On NauticEd Training School. To gain the Rank of "Skipper (small keelboat)", the student must take and pass the Skipper Course and the Maneuvering Under Power Clinic. The Skipper must then have a minimum of 10 small boat qualifying days out on the water to achieve Level I OR the student can be verified skipper competent by a NauticEd instructor with a minimum of 4 days on the water. To gain the Rank of "Skipper", the student must take and pass the Skipper Course and the Maneuvering Under Power Clinic. The Skipper must then have a minimum of 10 skipper qualifying days out on the water to achieve Level I. A student who has passed the theory requirements for Skipper but has only 4 or more qualifying days on the water but less than 10, is still ranked as Qualified Crew. As soon as they log the 10th qualifying day, they will automatically become a Skipper. To graduate to the Rank of a "Bareboat Charter Master", the Student must in addition to the Skipper courses, complete the Bareboat Charter Course, the Coastal Navigation Course, the electronic Navigation Course and the Anchoring a Sailboat Clinic. A Bareboat Charter Master can not have less than 50 days of qualifying experience on the water. 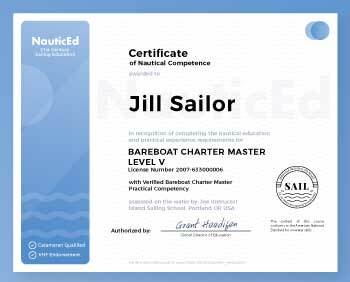 Note, if sailing in European waters you need the International Certificate of Competence (ICC) - created by United Nations under Resolution 40. See here for information on the (ICC). To further graduate to a "NauticEd Captain", the student must then additionally take the Weather, Sail Trim, Storm Tactics and the Safety at Sea Clinics. A NauticEd Captain can not have less than 50 days of qualifying experience on the water. The NauticEd software will automatically take care of calculating your rank and level at any time. How do I progress through the Sailing Resume Levels? Level II is 25 days qualifying experience on the water. Level III is 50 days qualifying experience on the water. Level IV is 100 days qualifying experience on the water. Level V is 200 days qualifying experience on the water. In order to place real value on the experience, each day of experience must qualify according to the rules below. Can be crew or Master experience – it doesn’t matter. At least 50% of experience must be on vessels that are 20 ft (6.1m) or longer. At least 50% of the days must be as Master of the vessel. At least 50% of experience must be on a vessel 20ft (6.1m) or longer. Vessels must be 20 ft (6.1m) or longer. At least 50% of experience must be on a vessel 25 ft (7.6m) or longer. At least 50% of experience must be on a vessel 28 ft (8.4m) or longer. Must be on a sailboat. Similar to the USCG standard, a day is considered a minimum of 4 hours underway in any calendar day. Eight hours in a day is still one day. A student has completed the Skipper Course, Maneuvering Under Power Clinic and has 35 days out sailing: 20 days on a 25 ft sailboat as the master of the vessel, 15 days on a 22 ft day sailor as crew. The student is ranked as a Skipper Level II. A student has completed the Skipper Course, Maneuvering Under Power Clinic, Bareboat Charter Clinic, Coastal Navigation Clinic, and the Electronic Navigation Clinic. She has 100 days out sailing. 50 as master of the vessel on a 32 ft sailboat, 10 as master of a 25 ft sailboat and 40 as crew on a 22 foot sailboat. The student is ranked as a Bareboat Charter Master Level III. A student has completed the Skipper Course, Maneuvering Under Power Clinic,. He has 13 days as master of a 24 ft vessel and 13 days as crew of the same 24 ft vessel. He has also been checked out by a NauticEd accredited Sailing School to the Skipper competence ability. The student is a Skipper - Small Keelboat Level II. In essence - don't worry too much about this - just log your time honestly and the algorithm will take care of it. The NauticEd sailing certificate software keeps account of your sailing resume through your entries. Entries are tracked by date, type and size of boat and as crew or master of the vessel. Students can even set up their favorite boats for quick entry. This is all simply done via the NauticEd website, NauticEd iOS App, or a hand-held web browser page. The NauticEd software will automatically take care of calculating your level at any time according to your entries and the rules above. The Verified Competency Mark is an acknowledgment that the student has been practically assessed by an accredited NauticEd Professional Sailing School and has demonstrated a level of on the water practical competence. The assessment can take place at the end of a training session or just by special request. Following the assessment, the Professional Instructor thens log into NauticEd, securely locates the student's profile Online and then verifies the profile for sailing competence. The NauticEd software then automatically places the mark on the logbook resume. With further practical experience and instruction the student can continue to upgrade their demonstrated ability to the next competence grade. The student can not attain a competence level grade if they have not completed the theory courses to the same rank. 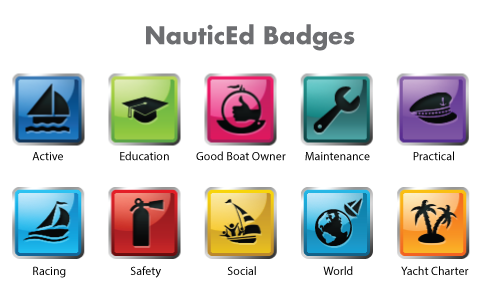 The NauticEd software makes available to each Student their real time Logbook Resume for FREE. At anytime, a student can download from the NauticEd cloud the Logbook Resume as a PDF document and email to any charter company, practical school or others. Or the student can make the resume accessible to yacht charter companies via http://www.nauticed.org/student_verification. The yacht charter company enters the student's login email address and logbook code. The logbook code is code made up by the student and stored in the student's profile. In this manner, the student never has to carry a logbook with them or worry about where it is stored or worse yet re create it every time they want to charter a yacht. It is always available 24/7 in the cloud. The Logbook Resume is securely protected. Only persons given express permission via their secret logbook code by the student can view the Logbook Resume. The NauticEd mobile App also allows the student to update their logbook anytime. How do I Progress Through Badges and Status? Badges and Status are a way to self measure how you're doing regarding good boater practices. Many times, new (or even experienced) boaters don't know what they don't know. And by the mere not knowing, some dangerous bliss can creep in. With NauticEd badges we reward you when you start doing the very things that are almost mandatory to keep you, your vessel and your crew safe on the water. If you want to be an excellent boater/yachtie, you should have many NauticEd Badges and NauticEd Status. Learn more about Sailing Badges and Status. What is the cost for the NauticEd Resume and Logbook Tracking system? Students pay for online classes and on the water instruction, but the entire sailing resume and logbook tracking system is at completely FREE. Start building your NauticEd Sailing Resume today. Take the NauticEd Skipper Course and the Maneuvering Under Power Clinic. At anytime you can begin building your FREE Logbook Resume. Simply enter your sailing history and experience as you go online when you login to your NauticEd account. Download the iPhone application to log your everyday experience. On your iPhone App store search for "NauticEd" or go to our Sailing Apps page.